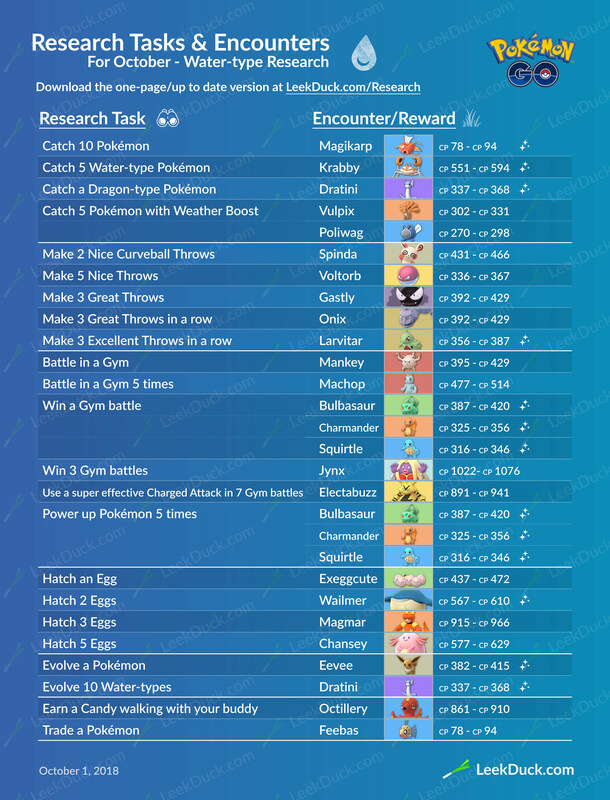 These are all the available Field Research Tasks in Pokémon GO for the month of October. The current reward encounter for a Research Breakthrough is Suicune. Go to Field Research FAQ below. If errors are found in this graphic, it will only be updated here. What are the CP numbers next to the Pokémon? That is the range of possible CPs that your Pokémon encounter could be. The highest is Perfect IVs and the lowest is not so perfect IVs. What is the Sparkle next to some Pokémon? The sparkle indicates that there is a chance of encountering that Pokémon in their Shiny form. The chance of encountering a Shiny from a Field Research task is 1 in 450. However they could possibly be higher for certain encounters (eg. Absol). What is Research in Pokémon GO? Research is a feature in Pokémon GO that gives Trainers the opportunity to help Professor Willow with his Pokémon Research. Completing a Research Task will unlock rewards. The more challenging a task, the greater the reward will be. There are two types of Research you can contribute to: Field Research and Special Research.